Trakka is going from strength to strength. https://safika.co.za/assets/uploads/trakka-video-poster-705x423.jpg 423 705 Jef https://safika.co.za/assets/uploads/safika-logo.svg Jef2015-10-29 12:43:352018-09-28 12:22:52Trakka is going from strength to strength. Safika sponsors educational visits by underprivileged schoolchildren to ArtMode. Vanessa Holiday, convener of Cape Town’s ArtMode exhibition, has thanked Safika for sponsoring educational visits by underprivileged schoolchildren to ArtMode. “Sheer joy and wonder is the best way to describe the reaction of the children, most of whom had never been exposed to art before,” she said. https://safika.co.za/assets/uploads/siyanzigisa-3.jpg 646 1024 Jef https://safika.co.za/assets/uploads/safika-logo.svg Jef2015-06-03 13:32:442018-09-28 12:26:09Safika sponsors educational visits by underprivileged schoolchildren to ArtMode. Safika is taking art education to underprivileged Cape Town schoolchildren by sponsoring Artmode, an innovative art exhibition in which visitors can see the artists at work. Safika will take children from poor schools that do not offfer art education, to Artmode, where they will get a guided tour of the exhibition and participate in art workshops facilitated by Bloemfontein-born artist Atang Tshikare. Tshikare has taught art all over the world and is known internationally for his ability to develop creativity in young people. Ngoasheng said that he would like to see children from underprivileged backgrounds have the opportunity to become artists and art curators and administrators. Artmode opens on Thursday May 21, 2015 at 18:00 at the Biscuit Mill in Woodstock, Cape Town. Safika partner company Trakka plays an important role in US rescue efforts. Technical high altitude hoist rescues are a large part of Two Bear Air’s operations. Here, its Bell 429 shows what it can do. Flathead County, in Northwestern Montana, contains some of the most ruggedly beautiful land in the United States. More than 94 percent of its over 5,000 square miles are national or state forest land, wilderness, or used for agriculture or timber, and its soaring mountain ranges and expansive lakes create a natural playground and are an irresistible draw to residents and visitors alike. But what makes the county particularly special is the unique form of aviation support it receives, in the form of Two Bear Air. The operation has been providing lifesaving search-and-rescue (SAR) services, as well as flying law enforcement missions, since its launch just two years ago. For those living in or visiting the region, the mere fact that there’s a SAR aviation unit at all is something for which they’re hugely thankful. 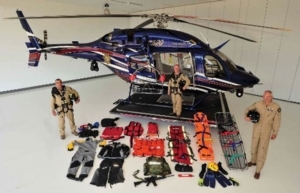 And the fact that it’s operating a brand new hoist-equipped Bell 429, as well as an MD 500E, would make it the envy of many SAR aviation units around the country. But for an outsider, the most noteworthy aspect is how the service is funded — at no cost whatsoever to the taxpayer. And those who are rescued never have to pay a cent. All costs for the operation, from the acquisition of the aircraft to the associated training for the aircrews and maintenance, are covered by local philanthropist Mike Goguen. Thus far, Goguen has spent well over $10 million on Two Bear Air — his gift to the people of Flathead County. 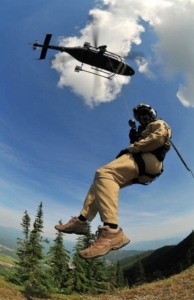 The program’s origins can be traced back to former Flathead County Undersheriff (now Deputy Sheriff) Jordan White’s efforts, in September 2011, to raise funds for SAR equipment to enhance the region’s capabilities. Goguen learned that there was a need for a hoist-equipped SAR helicopter (ALERT Air Ambulance serves the region with a Bell 407, but it doesn’t have a hoist), and Two Bear Air was quickly created. The initial crew consisted of White (who was appointed executive director of the operation), chief pilot Jim Pierce, and Flathead County Sheriff Chuck Curry. White and Curry were designated to be trained as the rescue flight crew. With a Bell 429 on order, Two Bear began operations with a Bell 407 in August 2012. With many lakes and rivers in the region it supports, Two Bear needs to be prepared to conduct rescues over water. The range of missions Two Bear flies is as vast as Montana itself. 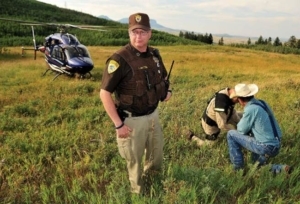 In addition to its SAR work, it conducts a broad range of law enforcement operations for local, federal, and state agencies, and its missions have taken it across Montana and into Idaho. The helicopters, operated as public use aircraft, are flown under the authority of the Flathead County Sheriff’s Office, which also provides the aircraft’s rear crewmembers. Two Bear also works in close partnership with Kalispell-based ALERT Air Ambulance. 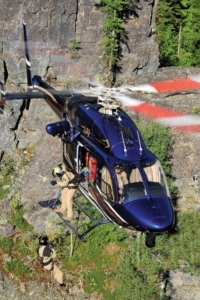 The combination of an MD 500E and a Bell 429 supports Two Bear’s mission profile perfectly. 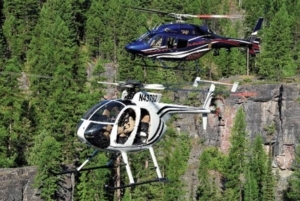 Two Bear’s Bell 429 (designated “Air 1”) and MD 500E (“Air 2”) are based at Glacier International Airport in Kalispell, Mont. And while the organization always planned to add the 429 to its fleet, the 500E was brought in when Two Bear’s Bell 407 was damaged while servicing a remote radio repeater site. White said the decision to replace the 407 with the 500E — rather than another 407 — was a practical one. “We felt a 500E would suit us better. It’s a smaller, more economical helicopter with a footprint that allows us to get into tighter places,” he said. Checking out a rancher after a search mission. With Two Bear lending a helping hand, local law enforcement agencies now have the air support they once could have only dreamed of. The training of the first crew was conducted over two intense weeks, with additional crews taking part in subsequent sessions in Kalispell. The initial crew then completed an advanced training curriculum, allowing them to perform night hoists, high-angle and swift water rescues, hoisting to vessels, and rescue swimmer deployment. The 429’s cockpit is fully NVG-compatible, with night vision configuration completed by Bell, and goggles and training provided by Aviation Specialties Unlimited. Mountain hoisting can take place over 10,000 feet, but normal operation occurs between 4,000 to 8,000 feet. Two Bear uses a Goodrich high-speed hoist on the 429, and Pierce said it works well and maintenance is low. Along with standard survival gear, other rescue equipment carried on the aircraft includes a collapsible rescue basket, a collapsible litter, a screamer suit, a plastic backboard, a pep bag and rescue strops — with the majority supplied by Priority 1. The crew also carries sidearms and rifles if needed, as coming across a bear is not unheard of. Following an intense year of development at Two Bear, the next 12 months will see the organization continue to refine its operations, while expanding its relationships with nearby jurisdictions in both Montana and Idaho. “We travel and do presentations on our capabilities with anyone who asks,” said Pierce. “Our philosophy is using the resources we have to help save lives.” In this vein, Two Bear is currently working with the Glacier National Park and the US Forest Service to establish hoist insertion training programs for their staff. Further training in high-angle and swift water rescues is planned, and the organization’s crew continues to expand, with four new rear crewmembers recently joining. 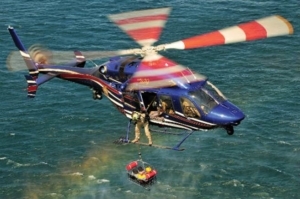 Having to operate in all conditions, the Bell 429 is fully equipped for both the law enforcement and rescue missions. Two Bear Air’s initial flight crew (from left): Sheriff Chuck Curry, Deputy Jordon White, and pilot Jim Pierce. When Two Bear took delivery of the Bell 429, the man funding the entire operation, Mike Goguen, spoke modestly about the investment he was making on behalf of his community. “You can’t put a value on saving even one life,” he said. “Montana is a place where we help our neighbors, and I feel privileged to be able to give this gift to the Flat-head Valley community.” And with such an immediate and dramatic impact made in the 429’s first year in operation, the enduring value of the gift of Two Bear to those in Northwest Montana over the coming years will be truly immeasurable. Siyabonga Gama. Visions of a visionary. Transnet Freight & Rail Chief Executive Siyaboga Gama cites Safika’s Saki Macozoma as in inspiration. The definition of a visionary: “Thinking about or planning the future with imagination or wisdom.” A long list of synonyms follows “inspired, imaginative, creative, inventive, insightful, ingenious, enterprising, innovative, perceptive, intuitive, farsighted, prescient, discerning, penetrating, sharp, shrewd, wise, clever, talented, gifted, resourceful”. The 2014 BBQ Visionary Award winner, Siyabonga Gama, Transnet Freight & Rail’s Chief Executive, ticks most, if not all, these boxes. Being taken completely by surprise winning the award, Gama says he believes that his role at the organisation is far from some of the portfolios which are usually celebrated by the mainstream – and the recognition is a huge boost for his existing burning passion for what he does. To head up an organisation as instrumental as Transnet Freight Rail to support and help grow South Africa’s economy requires an extraordinary amount of focus. The BBQ Visionary Award solidifies the fact that Gama is steering his ship, or train for that matter, in a progressive direction. “I was not expecting to win an award because what we do as a company is far from the public eye. To receive the award was an amazing experience because it meant that, somehow, what we do is highly appreciated. The award is a sign that there is a level of awareness of the work we put in everyday. Awarding a leader for me qualifies as also awarding the organisation he/she is attached to — and I am glad that the transformation we have brought within the company is being recognised,” he modestly says. He says when an individual has ideas that are seen to have the potential to create a positive change within a particular context, that individual is often looked upon as a leader. Gama’s core belief is that a leader who is able to instill optimism in his team is able to push them towards owning the vision — and lead that vision forward by themselves under the guidance of a leader. Taking from his learning at a number of international institutions such as the University of Swaziland, Vrije Universiteit in Amsterdam, New York University and the University of Singapore, Gama believes that although people could be ‘born’ visionaries, they can also be nurtured, learnt and taught — it can even be acquired through observation. “By observing leaders such as Napoleon, Winston Churchill, Bill Clinton and many others, one can observe exactly what it takes to be an effective and influential leader,” says Gama. BBQ’s Visionary Of The Year believes that the important lesson that one can learn from observing established leaders is how they translate vision into execution. “In addition to that, by combining the different elements, you can pick up how they manage to create a powerful picture the future for their teams. It is also equally important to observe how those leaders position themselves to take the necessary action needed to make the vision a reality, and the necessary steps they take to ensure that their teams are tagged along — while executing their work,” he says. Transnet’s top man, who had his fare share of challenges in 2010/2011 when he faced harmful publicity surrounding false charges of corruption and/or dishonesty, believes that when obstacles are managed properly they can yield highly valuable lessons as they are a normal part of progress. Similarly, it takes fire to sharpen an iron. With a strong management pedigree in transport, logistics, operations and finance, Gama believes that no man is an island and that we all learn from others as we go about our business. Gama, a leader that believes in a quiet commitment to vision realisation, sees empowering subordinates as a way of allowing them to take the lead. “It is important for one’s vision to be heard — and to turn a thought into a heard vision. Learning how to let go of control is important for a leader — and this is one of the most undervalued traits of authentic leadership and leading from behind sometimes, while ensuring that the vision is not lost. Leaders need to know when to learn and unlearn things, and letting others lead your vision is just as equally important as having one,” he wisely concludes. https://safika.co.za/assets/uploads/siyabonga-1030x686.jpg 686 1030 Jef https://safika.co.za/assets/uploads/safika-logo.svg Jef2015-04-21 07:54:132018-09-28 12:31:11Siyabonga Gama. Visions of a visionary. Safika partner company, Spartan Truck Hire, has started a dedicated film division to cater for the the vibrant film and TV industry in South Africa. The division will cater for commercials, documentaries, feature films, stills and any other form of entertainment vehicle requirements. Spartan Film Division offers a 24 hour back up service and dedicated mechanical team on hand should their services be required. Its vehicles range from 1 ton LDV’s to 8 ton tail lifts and rigging is available for wardrobe panel vans, sprinters and shelves for lighting trucks. For more information on film vehicle hire, please call us on 076 821 2284 or email us at anneliese@spartantruckhire.co.za. Black Economic Empowerment’s Northern Cape manganese mine, Tshipi Borwa, has announced that it exported two million tonnes of manganese ore in 2014 and has become the fifth biggest manganese mine in the world. Tshipi exported one million tonnes of semi carbonate medium grade manganese ore in its first year of production, and two million tonnes in its second year. “This aggressive production ramp up was achieved in spite of numerous challenges encountered developing the R2.2 billion mine, which included the construction of a state-of-the-art processing plant, railway carriage loading station and railway siding,” said Robinson. “This unprecedented milestone has been achieved through the sheer determination and unwavering support of our staff, regulatory authorities, Transnet and our principal contractors, Aveng Moolmans, African Mining and Crushing and Fraser Alexander (Bulk Tech). It is a testament to what can be achieved if we work towards the realisation of a common goal,” he added. Tshipi é Ntle Manganese Mining is a joint venture between Ntsimbintle Mining, Jupiter Mines and OM Holdings. Robinson said that Tshipi’s strategic partnership with OM Holdings, a leading manganese ore and metal producer and marketer, listed on the Australian Stock Exchange, has assisted Tshipi to penetrate the Chinese, Korean and European markets under very difficult global economic conditions. The John Taolo Gaetsewe Development Trust, a broad-based Northern Cape NGO is also a significant shareholder. The majority of the Tshipi product was railed to the ports of Port Elizabeth, Ngqura and Saldanha via the Transnet National Rail Network, with the remaining ore being transported via road/rail combinations.